Mario and Steve aren't so different, if you think about it. They're both normal, chunky dudes, doing their best to survive in fantastic worlds full of frightening beasts and unlikely geography. 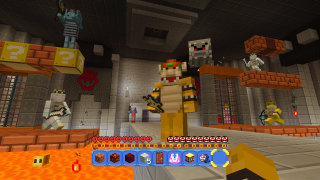 That must be why the Super Mario Mash-Up Pack for Minecraft - Wii U Edition feels so right. The free DLC pack from Nintendo, Mojang, and Microsoft adds 40 player skins to the game, letting you and your friends roll around as standbys like Mario himself, Luigi, Peach, and those damn Koopalings that keep showing up everywhere. New world and item textures are included to make for a more Mushroomy kingdom, and even the creatures and monsters are transformed into Hammer Bros., Dry Bones, and the rest of the gang. The Super Mario Mash-Up Pack also comes with 15 music tracks from Super Mario 64, and a pre-made world that includes Peach's Castle and other familiar sights. Minecraft: Wii U Edition will get the new pack in a free update on May 17, and it will be included in retail copies of the game when they start hitting stores on June 17.